Welcome to My Tablo Account! Thank you for buying Tablo! 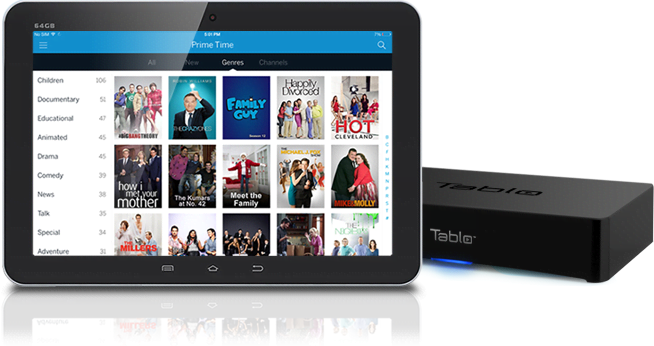 In order to get the most out of your Tablo Over-The-Air HDTV DVR, you'll need to create an account to register your product and select a guide data subscription. Why should I register my Tablo? Registering your Tablo enables us to help you make your Tablo experience better. By registering, we can keep you informed with information about new features, firmware and app updates and other important Tablo news and special offers. To enjoy the full Tablo experience, a subscription to our guide data service is required. For just $4.99 US a month, our guide data provides the beautiful cover art, episode and series synopses and metadata that make it easy to browse content and set recordings on your Tablo through our various apps. It also enables us to provide some of our cooler features. You can read more about what your Tablo subscription gets you here. Every Tablo includes a free 30-day subscription trial. After 30 days, if you choose to forgo a subscription, Tablo does include a manual mode that enables access to basic recording and Live TV functionality. If at any time you'd like to add or change your subscription you can do so through the My Tablo Account portal. That's OK. We'd still like to keep you posted on important Tablo news. You can sign up to receive our newsletter here. All content © 2019 Nuvyyo inc.